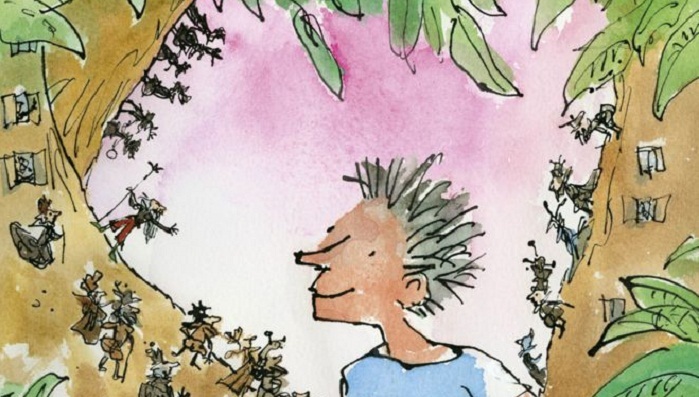 Roald Dahl's final children's book has been illustrated by his longtime collaborator Sir Quentin Blake, 26 years after it was first published. Billy and the Minpins was originally published as The Minpins in 1991, shortly after Dahl's death, with illustrations by Patrick Benson. An updated version has now come out with new pictures by Sir Quentin. It was the only children's book by Roald Dahl that Sir Quentin had not provided illustrations for. Dahl's other works, including Charlie and the Chocolate Factory, Matilda and James and the Giant Peach, have made him a favourite for millions of children. The Minpins remains one of his least-known stories and has now been republished and renamed Billy and the Minpins - using one of Dahl's draft titles - in an attempt to bring it to a wider audience. It tells the story of young Billy, who discovers tiny tree-dwelling people called Minpins and helps save them from a fire-breathing beast called the Gruncher. Announcing the new edition, which has almost 50 pages of black-and-white drawings, Sir Quentin said it felt like "the cornerstone in our long collaboration together". He said: "As Roald's parting gift, Patrick Benson's illustrations in the original edition were perfectly suited to the lyrical feel of The Minpins. "I have always greatly admired Patrick's artwork and am so pleased both books will sit alongside each other, reaching fans of all ages."